Slovakia lies in the heart of Europe. Using Mapquest, you can see that Kezmarok is located toward the northeastern border of Slovakia, northeast of Poprad and south of the Polish border, at Latitude 49°8ֲ´, Longitude 20°25ֲ´. The current population of Kezmarok is about 17,000, and is located on the Poprad River. Where Jews lived in the in the 19th Century on the same map. Mikulas Liptak, who lives in Kezmarok, collaborated with this page's compiler (Madeleine Isenberg), since 2004. He painstakingly indicated with colored dots where Jews once lived in the Spis Region. For some of the towns, some dots indicate Jewish cemeteries that have already been documented there, or are in process. One can find information on the general history of the town of Kezmarok from various sources including the internet. Very few mention anything about the Jews who once lived there. The following section describes the history of Kezmarok as it pertains to the Jews who came to live there in the middle of the 19th century and onward. The Database of Jewish Communities - Beit Hatfutsot - The Museum of the Jewish People, Tel Aviv, Israel. Kezmarok lies on the river Poprad in the southeastern part of the High Tatra mountains, in the county of Spiš (in Slovak (pronounced speesh in English); Szepes in Hungarian; Zips in German), and is 240 miles northeast of Budapest by rail. The town had been a center of trade and industry. Until 1918 the region belonged to the Austro-Hungarian Empire and from then until 1993, to the Republic of Czechoslovakia. Until 1939 the town had been the center of German culture in the Spis region. The citizens of Kezmarok had objected to the settlement of Jews in their town and therefore the settlement of Jews at Kezmarok began only in the 1850's. Most of them came from the neighboring villages and were joined after World War I by refugees from Poland, particularly from Galicia. Since they did not have their own official rabbi, in the early years of settlement, the Jews of Kezmarok were initially affiliated with the Jewish community of Huncovce (also known as Hunsdorf, in German). Later, Kezmarok became an independent community and following the general congress of the Jews of Hungary. In 1868-9, it joined the Orthodox stream of the Hungarian Jewish communities. The Jews of Kezmarok were indeed traditional in their way of life but they were in favor of general education and their language was German, although they also spoke Hungarian and Slovak. The first Rabbi of the community, Rabbi Abraham GRÜNBERG, was appointed in 1874. After his death in 1918, his son Rabbi Simchah Nathan GRÜNBERG, succeeded him. Rabbi Israel Meir GLÜCK served as a Dayan (religious judge) and as a Rabbi in the Talmud Study Society. The community maintained a secretary, a beadle, and teachers for the little children. The Shochets (ritual slaughterers) served also as cantors, and some were also mohels (circumcisers). A synagogue in the Moorish style, with 500 seats, was built towards the end of the 19th century. A lecture hall was on the floor above the synagogue, which served for public prayers in the winter. The Kloiz, the Hasidic Bet Midrash, had some 200 seats. The Rabbi of the Hasidim was Rabbi Arieh HALBERSTAM, a descendant of Rabbi Haim HALBERSTAM, the father of the Sanz dynasty of Hasidic Rabbis. There were Heders and Talmud Torah schools at Kezmarok but most of the Jewish children went to general elementary schools using the German language, and from the 1930's to state schools, which taught in the Slovak language. Many of the children continued their studies at the school of commerce or the gymnasium. The Bet Midrash, which Rabbi S. N. GRÜNBERG founded in the court of his house, was attended by some 30 students. Among the institutions of the community were: a Hevra Kaddisha, a women's society, an "Ezrat Nashim" society, a "Poalei Zedek" society, and a "Tiferet Bahurim" society. Charitable funds existed for the support of the old communities in Eretz Israel (like Meir Ba'al Haness), a fund for Yeshivot in Eretz Israel, as well as a "fund for the poor of the country" -- which supported Jews from Carpatho-Russia and kept a hostel for wayfarers. In 1921 when Desider ARJE was the head of the community, there were 1,650 Jews in the community of Kezmarok, including the Jews of the neighboring settlements Spisska Bela and Podolinec. Most of the Jews of Kezmarok were well established economically. They owned about 80% of the town's places of business: shops, coffee houses, inns and kosher restaurants, fashion workshops, better clothing and footwear, wood processing workshops, sawmills and petrol stations. Among the Jews of Kezmarok were some great merchants, producers and exporters of cheeses, farmers, professional people and artists. There were also professionals such as lawyers and doctors. In fact, most of the town's doctors were Jewish. In 1903 the Zionist society "Achei Zion" began its activity at Kezmarok and many homes kept the blue charity boxes of the Jewish National Fund. The Zionist activity slowed down during the war years (1914-1918), when many Jews enlisted in the Emperor Franz Josef's army and some of them were killed in action. In the republic of Czechoslovakia between the two world wars the Jews were recognized as a national minority and the Zionist activity intensified. Local branches were opened by Hapoel Hamizrachi, Bnei Akivah, Hashomer Hazair, Maccabi Hazair, Tekhelet Lavan, Betar, and the sport club "Hagibor". Prior to the elections to the 15th Zionist congress in 1927, 33 shekels (membership in the Zionist organization and a voting right) were acquired and in the elections to the 20th congress (1937) 76 Jews of Kezmarok took part. During the 1930s some young men of Kezmarok went to Eretz Israel. Agudat Israel and Zei'rei Agudat Israel were also represented in the community. In 1940, 1,185 Jews were living in Kezmarok; In 1948, 384 Jews (of these, 58 were children). Some of these books are rare and difficult to find, but have invaluable infomation about the life and times of Jews in Slovakia and/or Austro-Hungary, of which it was once a part. Toldot Yehudei Kezmarok v'Hasviva, The History of the Jews of Kezmarok and its Surroundings, by Mr. Shmuel Dov Gvaryahu-Gottesman, published, Jerusalem, 1992 (in Hebrew). An on-line library copy can be found in the New York Public Library in their Yizkor (Holocaust Memorial) Books collection. Toisent Yor Yiddish Leben In Ungarian - A Thousand Years of Jewish Life in Hungary, by Yekutiel Yehuda (Leopold) Greenwald, Columbus, Ohio, 1945 (in Yiddish). A PDF version exists at HebrewBooks.org . At that website, add the following after the URL, /03383 to bring up the Greenwald Book. Jews in the Spis Region, I. Kezmarok and its Surroundings, by Mikulas Liptak and Madeleine R. Isenberg, 2nd edition, Kezmarok, Slovakia, 2010. (ISBN 978-80-89264-48-9). This is a dual language book, in Slovak and English and some copies are still available for purchase. Contact Madeleine Isenberg for more information. A Brief History of Slovakian Jewry from JewishGen's Yizkor Book translations. Kezmarok from Encyclopaedia of Jewish communities, Slovakia. This is a translation of the "Kezmarok" chapter from Pinkas Hakehillot Slovakia, edited by Yehoshua Robert Buchler and Ruth Shashak, published by Yad Vashem, Jerusalem, 2003. Another Kezmarok site, with information about the Kezmarok castle and permanent exhibitions to be found in it. A Virtual Tour of Kezmarok This site has some wonderful photos that rotates to give you a 360 degree panoramic view of places in Kezmarok, as if you are standing and slowly turning around to see all around you. This particular link is to a street scene that rotates and lets you also see part of the Thokoly Castle. This is now a museum and it even houses a section dedicated to the Jews who once lived in Kezmarok. A History of Kezmarok by Dr. Nora Barathova, translated from Slovak into English. Thanks to the suggestion by Shaul GASSNER that some kind of memorial should be created to the Jews who once lived in Kezmarok, a plan 13 years in the making came to actualization on the 18 November 2013. 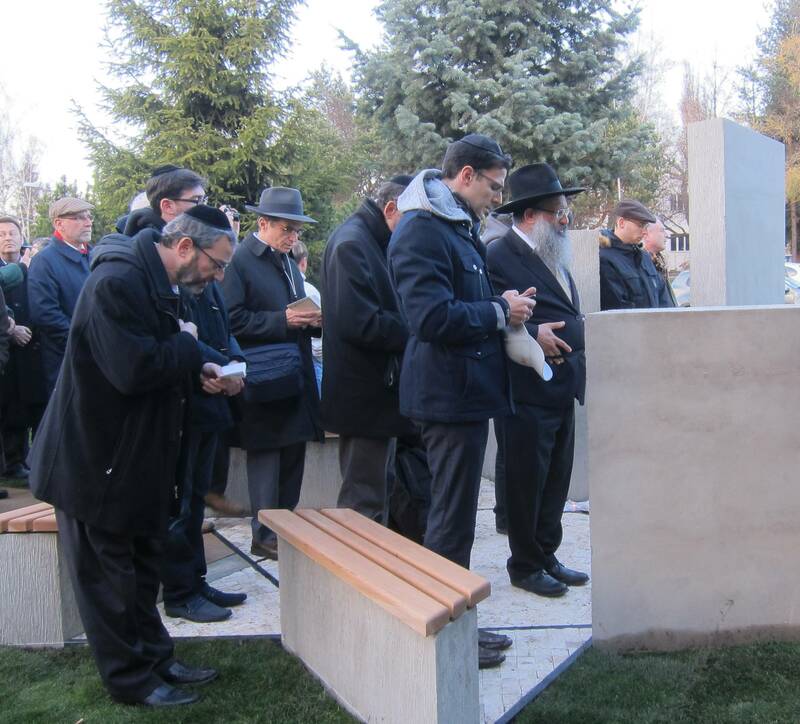 A special memorial service took place in Kezmarok very close to where the town's synagogue, Adas Yeshurun, once stood. This was to dedicate a memorial to the Jews who once lived in Kezmarok, 90% of whom were killed in the Holocaust. 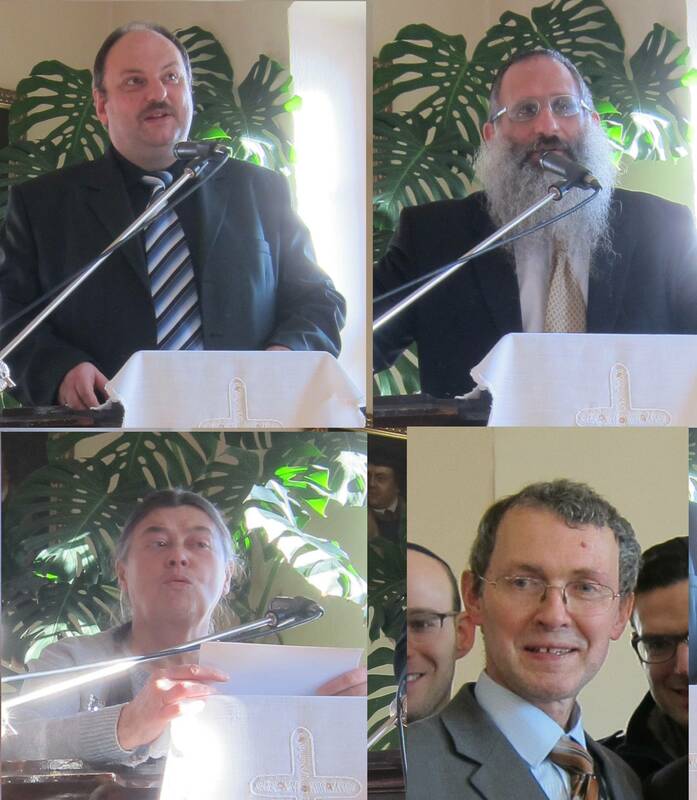 15 people, descendents of Rabbis Meir Grünberg and Yisrael Meir Glück, and of families Vogelmann, Gassner, Goldman, and Goldstein traveled and converged from Los Angeles, New York (in the USA), and from Rechovot, Israel to attend. This was part of an all-day event, coinciding with Kesmarok's periodic, "Days of Jewish Culture," in which local historian, Dr. Nora Barathova, and book-publisher/tour guide Mikulas Liptak, give talks with slide presentations to enlighten the local gentry and visitors about the once thriving community of Jews who made Kezmarok their home and contributed to the daily life of the town. In a great demonstration of ecumenism, the effort to collect funding for the design, fabrication, and final actualization was undertaken by Kezmarok's local Lutheran Church, under the leadership of Mgr. Roman Poruban. In reciprocation and appreciation, funds were donated and collected by descendents and relatives of those martyred Jews and given back to the church. Two special people who took the 5-hour train ride from Bratislava, were Chabad Rabbi, Boruch Myers who officiated as the rabbinical presence and the German chargé d'affaires, the Honorable Reinhard Wiemar. Others came from Kosice and various other parts of Slovakia for the day. Rabbi Myers also brought a Torah for the morning services, since miraculously, this was the first time in 65 years that a minyan (a quorom of 10 men) had gathered for prayers in Kezmarok! Rabbi Myers also brought with him banquet-worthy food prepared by his wife, Chanie, to ensure our festive luncheon was kosher! Officials from the town council also spoke and a respectful crowd of Kezmarok's residents attended as well. As part of the days events, the visitors from abroad sought the locations of homes where their ancestors lived; visited the cemetery where loved ones were buried pre-World War II; and viewed the displays in the Jewish section of the museum that is now in housed in the former Thokoly Castle. The group photo below was taken in the museum as the parting commemorative photo. Below are just a few photos and hopefully a more detailed collection in PDF form will be added. Parts of the day were captured in the news and on video by visiting TV and newspaper journalists but these are in Slovak. One such program appeared on January 12, 2014, but may be hard to view. You may also see a brief portion of the Kezmarok News that was broadcast on TV on 20 November 2013, by clicking on the third item to the right of the screen. But it is almost entirely in Slovak. Robert Burger, assistant to the architect, Architect Miloslav Neumann, Ing. 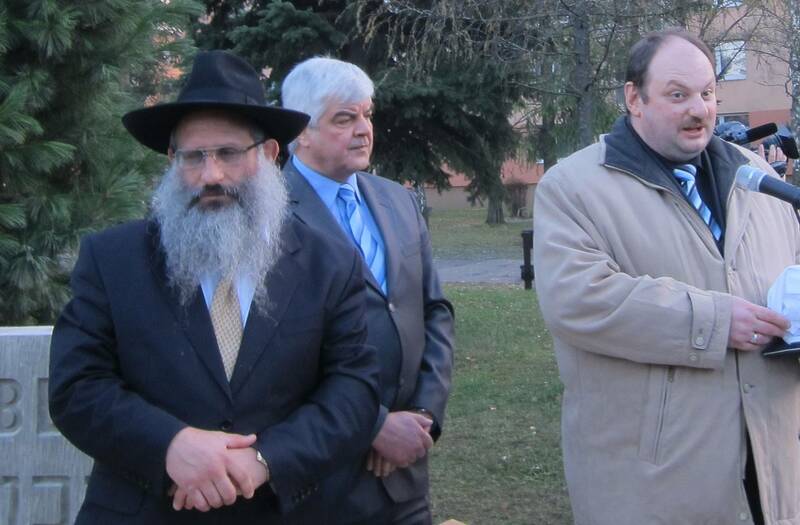 Ladislav Faix, Mayor Igor Sajtlava, Rabbi Baruch Myers, Mgr. Roman Poruban, German Chargé d'Affaires Reinhard Wiemar. Last chance to pray with a quorum, as the the men gather for Mincha (Afternoon) service. A group called "Christian Friends of Israel" showed thier support. Many believe they might have some Jewish ancestry also! Jack FRIEDMAN (great-grandson of Rabbi Yisrael Meir GLÜCK), Peter NURNBERG (in back), Gity CHARNAS (granddaughter of Rabbi Meir GRÜNBERG), her husband Kalman CHARNAS, bending in front of her, Jeff FRIEDMAN (Jack's son), Dovy FRIEDMAN (kneeling below, Mayer's son), Thomas VOGELMANN, Mikulas Liptak (in back), Madeleine ISENBERG, Michael FRIEDMAN (Jack's brother), Michael's sons Stevena and Alan next to him, Hagit TSAFRIRI and her sister, Ilana EYAL, Yitzchak GASSNER, and his wife Yael. Inset of Yehudit and David BAREKET, who missed being in this photo. At the time this website was first created (10 December 2010), many people had contributed information, photographs, and letters, over the past 20 years that they had either from the time they themselves lived there (pre-World War II) or from their ancestors who once lived in or near Kezmarok. Many contributors were related to some degree to Madeleine Isenberg who created this Kehilalinks page, in part as a memorial to our family who once lived in Kezmarok, and to so many who were killed during the Shoah. The following is a list of the family names from Kezmarok that are common to these contributors. More family names may be added as more information comes to light. Family names from other contributors will be added as more information becomes available. The major contributor, not related in any way to the above, but who currently lives in Kezmarok and has been an invaluable source of information and support since 2004, is Mikulas Liptak. Since it came on-line, a few people with connections to Kezmarok have contacted Ms. Isenberg. They are listed below as well as their contributions. In some cases, they are asking the assistance of anyone who can help identify people in photographs. Contributions in the form of assistance from Mr. Marshall KATZ in preparing these webpages, has been greatly appreciated.